As a self-proclaimed former mermaid, I’m naturally drawn to salt-based beauty products. I love the texture sea salt brings to my lifeless, fine hair. I love the detoxifying feeling of relaxing in a hot salty bath. And now, I love the gentle scrub of a salty exfoliating face polish — specifically, this one from Trillium Organics. My friends at Foxy Mango offered to send me some goodies from brands I’d never tried before, and Trillium was one that was on my radar but I’d never sampled before. 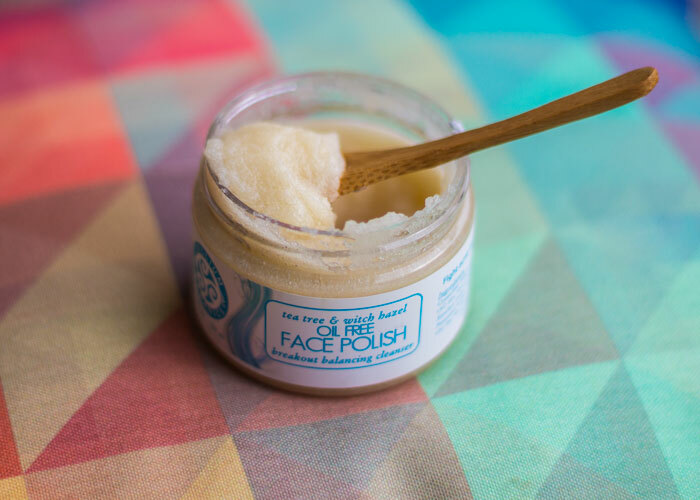 I of course was drawn to the Oil-Free Face Polish (hi, fussy skin), and while tea tree oil and witch hazel aren’t news to me when it comes to treating and preventing breakouts, the idea of exfoliating with salt seemed a bit new to me. Sounds kind of basic, right? Most of us see sugar scrubs galore, but they’re usually body-based. Salt scrubs are around, too, but I rarely see them for the face, mostly because salt can be a bit drying. However, if you’re super acne-prone and just need a simple, weekly exfoliating treatment, salt can do wonders. It’s naturally antibacterial and has some astringent-like properties (please, please, please don’t use salt on huge breakouts or delicate skin — it can sting! ), making it a nice fit for problem skin. I used Trillium’s Oil-Free Face Polish a couple times a week during my morning shower. As it got steamy in there — and my pores more open and receptive to a good exfoliation treatment — I would massage this salty (yet never chunky or abrasive) polish into my face very lightly. I like that the saltiness is balanced with nourishing aloe vera and honey, and that the acne-fighting properties are boosted with witch hazel, lavender and tea tree. Jojoba beads add an additional oomph to this salt scrub, but they also impart a bit of that silky feel to the skin as well. While I liked this salty scrub, I don’ think it’s a repurchase for me, mostly because I think it could be a relatively straightforward DIY. However, if DIY ain’t your thing and you want a salty fix, Trillium Organics’ Oil-Free Face Polish is an inexpensive, nicely packaged solution to your breakout woes. Have you tried anything from Trillium Organics? Do you use salt scrubs on your face? Tell me in the comments section!